DeLena Ciamacco: The Real Estate Expert: NEW LISTING IN GALENA! 6.27acre wooded & ravine lot on “no-through” street with 24x40 detached Garage, 30x50 steel Barn/Building with car lift & brick firepit! Custom brick home loaded with upgrades! Hardwood floors everywhere! Island Kitchen with wrap around, cherry cabinets & new granite countertops. Family Room with granite wood-burning fireplace walks out to a giant Screened Porch with cathedral ceilings. Master Suite with Sitting Room/Nursery & updated shower Bath. Finished Basement with Recreation Room & Gym Area. Additional 5.74 acres available! Must See! 4 BR’s & 2.5 Baths. ~3,200 SF! Big Walnut Schools. Only $619,900! Call DeLena Today! NEW LISTING IN NEW ALBANY!! 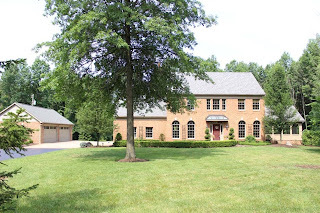 NEW LISTING IN UPPER ARLINGTON!! NEW LISTING IN MOUNT VERNON!